The island of Hawaii, also called the Big Island, is comprised of 9 districts – Hamakua, North Hilo, South Hilo, Puna, Kau, South Kona, North Kona, South Kohala and North Kohala. The mountains Mauna Kea and Mauna Loa sit in the middle of the island dividing the island into east and west. East Hawaii is markedly tropical in climate with frequent tropical rains and lush forests while West Hawaii is usually dry and sunny. 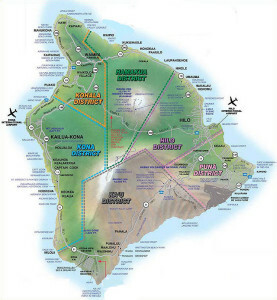 The southern region of the Big Island offers affordable housing and land and a variety of climate options. The Ka‘u district of the Big Island encompasses the largest and least populated area of the Big Island. Much of Hawaii Volcanos National Park resides within Kau, as well as the south tip of the island, called Ka Lae- the southern-most point in the Island as well as the U.S.! Kau is home to both Punaluu – a beautiful black sand beach that is a popular spot for sea turtles (honu), the Hawaiian monk seal, and other native Hawaiian creatures – as well as Mahana, or Green Sands Beach, so-called for it’s yellow-green sand. The main hubs of social activity are the picturesque Naalehu and Pahala towns where one might find shopping and good food Hawaiian-style. Subdivisions and areas of Kau and lower Puna in which Kau Realty specialize includes: Hawaiian Ocean View Estates (HOVE), Hawaiian Ocean View Ranchos (sometimes called Hawaiian Ranchos or HOVR), Discovery Harbour, Mark Twain Estates, Green Sands/Kiolakaa-Keaa Homesteads, South Point, and the towns and areas of Ocean View, Waiohinu, Naalehu, Pahala, Wood Valley and Volcano. Hawaii’s Official Tourism Site – This site offers a lot of information on what current events and activities are offered on the Bis Island. It is mainly geared toward tourists and visitors, but is also a great resource for the kamaaina (local people). Hawaii Public Schools Website – This site is run by the Department of Education. It showcases all that public schools in Hawaii have to offer. Hawaii Tribune-Herald Newspaper – The Tribune-Herald is the local paper based on the Hilo side of the Big Island. West Hawaii Today Newspaper – West Hawaii Today is the local newspaper based on the Kona side of the Big Island. Ka’u Calendar – The Ka’u Calendar is a local newsletter based out of Pahala. It covers local events impacting the Ka’u/Ocean View side of the Big Island. 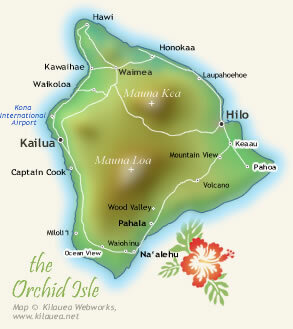 This is a general overview of the Big Island. It highlights the major towns on the island. Click on the map to open a larger view in a new window. This map shows the average rainfall trends on different parts of the island. Click on the map to open a larger view in a new window. The Big Island has one active volcano, Pu'u O'o, and one dormant (sleeping) volcano, Mauna Loa. This map shows the relative danger areas when Pele (goddess of the volcano) stirs. Search for Hawaii Real Estate using our complete Hawaii MLS search. Adjust your criteria, search by address or MLS number.